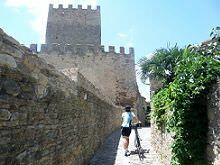 This fantastic cycling tour visits the beautiful region of Catalonia in the north-east of Spain. The holiday follows beautiful country lanes and coastal roads around the historic region, where you will visit Roman remains, Visigothic castles and countless Medieval villages. Catalonia and the Costa Brava has a unique and diverse history. Many great figures have helped to shape the fascinating culture which has been developing for over 3,000 years, including: Julius Caesar; Charlemagne; Napoleon Bonaparte; Antoni Gaudi; and Salvador Dali. This is very much in evidence in the small towns and villages, where you stay in enchanting boutique hotels and country houses. In addition to the magnificent history, the cycling is fantastic in this region. From the rugged coastline and sandy beaches of the Costa Brava, to picturesque vineyards and country lanes, every day is an enjoyable and rewarding experience. Using a combination of quiet lanes and cycle routes you are kept away from the traffic and can really connect with the scenery and discover the beauty of the region. This tour is rated as easy. The routes are flat or very gently rolling, with two route options each day to suit cyclists of all levels. 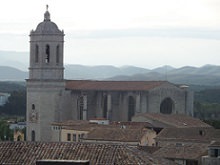 We will pick you up from Girona airport or train station and transfer you to the hotel in the historic center of Girona. From here you can explore the Gothic cathedral and the old town which are enclosed by city walls which originated in Roman times. Girona is also regarded as being - alongside San Sebastian - the gastronomic capital of Spain. There is a wide choice of excellent restaurants where you can sample traditional Catalan cuisine. The first day of cycling follows a scenic off-road cycle path out of Girona. The route follows a historic rail-road and passes through picturesque green countryside before reaching the Costa Brava ('The Wild Coast'). The route finishes in a beautiful spa hotel, situated on a stunningly isolated and undeveloped part of the coast. You begin today by heading north alongside the Costa Brava, admiring the beaches and coves in several small towns. As the coastline starts to become more hilly, the route heads inland on flatter roads and passes through the small, historic villages that are so typical of Catalonia. Pals, a Medieval Romanesque style town, makes a great place to stop for lunch, before continuing to the destination for the evening � Pertallada. 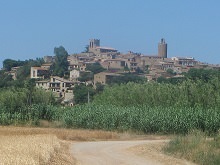 Peratallada is a beautiful village and one not to miss. It is dominated by a Medieval castle and city walls and contains numerous interesting boutique galleries and restaurants. Despite it's beauty and charm, the village is relatively untouched by tourism, giving you a real flavour of the true character of the area. Today you have two options, both of which are circular routes around the historic villages of the Baix Emporda region. Both routes follow quiet country lanes and off road cycle paths, regularly passing through the charming villages which characterize the area. Among the highlights is Ullastret; home to a pre-Roman Iberian settlement, as well as a beautiful 9th century church. The route today continues heading north along quite country lanes, passing some of the numerous vineyards in the region as you continue through the Baix Emporda region. Early on in the day you cross the narrow Medieval bridge in Gualta; site of a battle in the Napoleonic wars which was supposedly referenced in a painting by Francisco Goya. The day finishes in Torroella de Montgri; a picturesque site with a charming Medieval center. A 14th century hilltop castle also stands imperiously above the town. The final day of the tour continues along picturesque cycle routes, which pass through vineyards and spectacular sunflower fields. 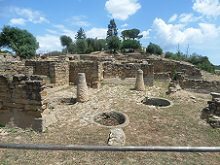 The highlight is the large archaeological site at Empuries. This contains remains and artefacts from the Ancient Greek city that was founded here, as well as a much larger Roman site which includes several temples, an amphitheatre, well preserved mosaics and many houses and streets. You stay in a beautiful country house, situated on the edge of the market town of St Pere Pescador. The tour comes to an end after breakfast. We will transfer you to Girona Airport or city center, or would be happy to arrange for you to extend the tour to other places in the region. 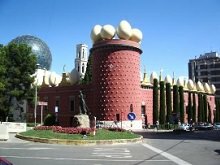 Popular extensions include nearby Figueres - the home town of Salvador Dalí - and Cadaques, a beautiful coastal village which was frequented by many great artists, including Dalí, Pablo Picasso and Marcel Duchamp. Please contact us if you would like to know more about extending the tour. *Based on two people sharing a double or twin room. If you would prefer to stay in a single room, the single supplement is applicable. Bike hire is included in the price of the tour. Six nights accommodation in double, twin or single room with en-suite. Please see price list for details of single supplement. Please browse through some of the frequently asked questions about this cycling tour. If you have any further questions, or would like any more information, please contact us and we will answer by email. How far do I cycle each day on this tour? There are two route options each day. The short route averages around 30km (19 miles) per day and is nearly all flat or gently rolling. The longest day is 39km (24 miles), but the second half of the route is gently downhill and so it is actually one of the easiest days. The longer route averages around 55km and is more rolling. There are also additional extensions each day in case you wish to cycle further. The long and short routes always begin and end in the same location, so you can choose each day which route you would prefer to take. If you would like to cycle significantly further every day, please contact us and we would be happy to organize an alternative itinerary. How difficult is this tour? This tour is rated as easy if you do the shorter routes. The routes are mostly flat, with just a few short rolling sections and no significant climbing. This is a great choice for a first time cycling holiday, or for experienced riders who like to enjoy the scenery and have fun off the bike, exploring a fascinating and culturally rich region. If you do the longer routes then it is rated as medium, with the optional extensions making it more challenging. The roads are very quiet on this tour. About half of the tour is on cycle routes which carry no traffic (apart from possibly the occasional tractor!). The other half is on quiet, narrow country lanes through villages. The arrival and departure point is Girona. We will pick you up from anywhere in Girona (airport, train station, hotel etc..) at the start of the tour, and will take you back to Girona at the end, so that you don't have to worry about arranging your own transfers. Girona has an international airport served by several airlines - notably Ryanair, who run flights to Girona from many destinations throughout Europe. If you can not find a suitable flight to Girona, you can also fly to Barcelona Airport which is about 120km to the south. From Barcelona there is a regular train service to Girona. We can also arrange transfers to and from Barcelona on request. Please contact us if this would be a more convenient option for you. For this tour we provide Giant hybrid bikes. Road bikes are available, but only for the longer routes, as the shorter routes have some sections on off-road cycle routes. Please see our bicycles page for further details. When can I do this tour? Spring and Fall/Autumn are the most popular times. In these seasons the weather is generally very pleasant for cycling. In July and August it can get hot and the towns are slightly busier with tourists (although the roads we ride are still very quiet). Winter is a great time to visit the region, as it takes on a different face. However, on occasion it can get cold, particularly in the evenings, so it is important to bring suitable clothing. What is there to do and see off the bike? This tour is genuinely suitable for everyone because there are so many options. On the bike there are routes of varying lenghts and difficulties, to suit riders of all levels. Off the bike, the region is fantastic for relaxing amongst beautiful orchards and vineyards, soaking in the atmosphere in Medieval towns and dining out in some truly exceptional restaurants. There are also plenty of opportunities to visit the numerous sandy beaches and rocky coves for which the Costa Brava is well-known. What if I don't want to cycle on one day? If you don't feel like cycling on any day, we are happy to transfer you directly to the next hotel when we come to collect your luggage in the morning. We believe that the hotels that you stay in are just as important as the towns that you visit and the scenery that you ride through. On this tour we have chosen a diverse mix of boutique hotels and country houses, which we feel best showcases the unique character of the region. 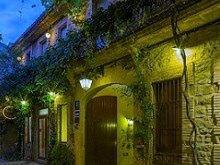 The hotels are mostly small and intimate, helping you to discover and experience the real Catalonia. In Girona you stay in a fantastic locally run boutique hotel, situated in the Jewish Quarter in the heart of the old town. 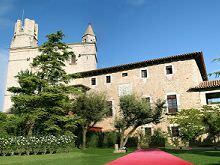 The hotel is less than 100m from the cathedral and the Girona Art Museum and is set in a beatifully styled stone house. With fewer than ten rooms, the hotel has a very personable feel and embodies the character and charm of historic Girona. Here we stay in a **** spa hotel situated on a beautiful, undeveloped part of the Costa Brava. This is the largest hotel on the tour, but is beautifully styled with large grounds and excellent facilities. The hotel also has access to a private beach and several beautiful coves situated on the coast. In Peratallada you stay in a 13th century Medieval building in the heart of the village. It is beautifully renovated and decorated, with fewer than ten rooms, providing the perfect combination of luxury and an authentic experience. It is set amidst the network of narrow, original Medieval streets that make Peratallada such a special and unique village. This small boutique hotel is set in a 14th century building in the Medieval center of Torroella. It has a large swimming pool surrounded by vast gardens and a terrace which are perfect for relaxing. The large rooms are all uniquely styled and in keeping with the historic nature of the hotel. The final night is spent in a Can; a small country house which is unique to the Catalan speaking part of Spain. With fewer than ten individually styled rooms, it provides another unique, intimate experience. The building dates from the 17th century and is surrounded by beautiful gardens and a swimming pool. To find out more about how we select our hotels, please see our accommodation page. To reserve a place on the tour, please follow the link below to continue to our reservation form. Once we have received the form, we will be in contact to confirm the booking and to arrange for the payment of the deposit. If you would like to do this tour in a group of more than six people as a guided tour, please contact us and we can arrange a private guided cycling holiday.